f it’s springtime in Denver, many at local firms know that they will soon get a knock on the door, their phones will ring, and their inboxes will fill up with emails from their peers asking them to donate to the Legal Aid Foundation of Colorado as part of the annual Associates Campaign. And they will answer that call. In 2005 — the inaugural year of the campaign — 125 individuals at 10 Denver firms donated almost $9,000. Fast-forward 12 years, and in March of 2017, over 1,200 individuals at 57 firms gave nearly $164,000 to legal aid. The Associates Campaign has become an integral part of the Foundation’s work, both from the perspective of dollars raised and in terms of building relationships with the next generation of Colorado attorneys. 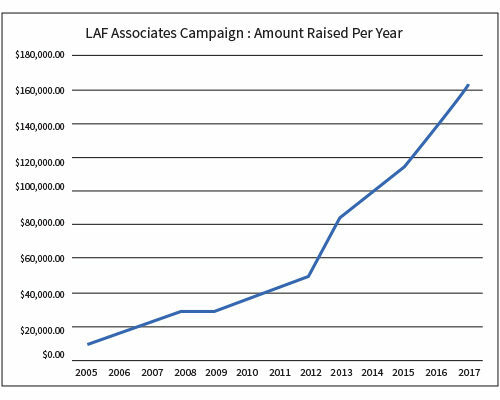 Before the 2018 Associates Campaign kicks off March 1, it’s worth taking a look at the Legal Aid Foundation, the history of the Associates Campaign, and the structure of this unique and very successful annual fundraising effort led by young lawyers. What Is the Legal Aid Foundation? The Legal Aid Foundation is a crucial part of the well-coordinated and interlocking system that has developed in Colorado for providing civil legal services to low-income Coloradans. The Foundation was created in 1981 in response to major funding cuts to the Legal Services Corporation, the federally-funded entity that provides operating funds to civil legal aid programs around the country, including Colorado Legal Services. When Reagan-era budgets slashed funding to the Legal Services Corporation, Colorado lawyers formed the Foundation to raise money from attorneys to help bridge the gap. Colorado Legal Services employs 50 full-time lawyers in 13 offices around the state. These attorneys provide free legal assistance to low-income Coloradans (usually those making less than 125 percent of the federal poverty line, or roughly $30,000 for a family of four) in areas as diverse and critical as family law, domestic violence, consumer and debt matters, housing disputes (including foreclosure and landlord/tenant problems), and benefits work for seniors and veterans. CLS attorneys provide a wide range of legal services, from drop-in clinics and legal advice over the phone through full representation in administrative proceedings and in court. Supporting this critical legal work is the mission of the Foundation and of the Associates Campaign. What Is the Associates Campaign? 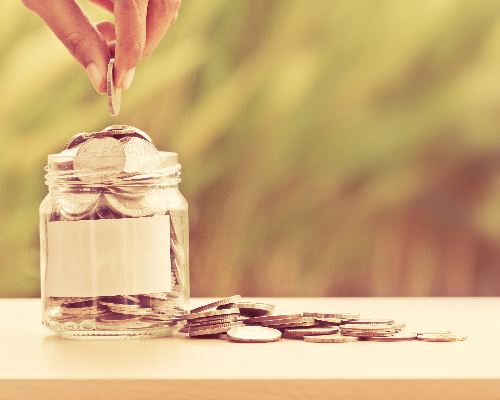 The Legal Aid Foundation has a robust Law Firm Campaign, where participating firms commit to giving a particular amount per attorney at the firm each year. In 2005, Law Firm Campaign Committee member and Davis Graham & Stubbs lawyer Kenzo Kawanabe became concerned about expanding individual support for legal aid and educating the next generation of law firm leaders about the enormous unmet need. To that end, Kawanabe decided that the most fruitful resource the Foundation could tap was “the inherent competitiveness of associates.” He conceived of the Associates Campaign as a month-long competition led by associates at Denver law firms to see which firms’ associates could raise the most money. From the start, the Associates Campaign was a success, but its growth over the years has been extraordinary. In 2005, 125 individuals from 10 firms gave $9,000, and last year 1,244 individuals from 57 firms gave nearly $164,000. And perhaps most impressive is that 35 of the 57 firms achieved 100 percent participation, which is to say every one of the associates at those firms made a gift to support access to justice. 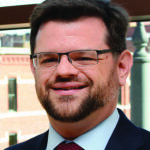 In 2013, the Associates Campaign received a big boost, when LAF Trustee and Holland & Hart lawyer Jon Bender formed the Associates Advisory Board — a group of young lawyers from Denver that meets regularly throughout the year to plan the campaign. The members of this Board use their personal contacts to recruit firm representatives from new and returning firms, and brainstorm new ways to boost participation and raise awareness about the campaign and the importance of the rule of law, access to justice, and civil legal aid. In 2018, the Associates Campaign is poised to have its most successful year yet. The campaign maintains the competitive structure it has had since its inception, but firms now compete in three different divisions, for small, medium and large firms. The competition measures success in several different categories: total dollars raised, total number of donations from all sources, improvement in participation from year to year, and — the most competitive category — highest per capita associate donation. The campaign also recognizes those firms that reach the most important goal of 100 percent participation among associates. This category serves the original purpose of the Associates Campaign: making sure that as many young lawyers as possible know about the important work of Colorado Legal Services and the Foundation, and building a habit of giving to support civil legal aid. So when March 1 rolls around, the legal community will be opening their doors, answering their phones, and responding to their emails in droves, all to support the Legal Aid Foundation of Colorado and Colorado Legal Services. Kyle W. Brenton is a senior associate at Davis Graham & Stubbs, where he specializes in appellate practice. He has been a member of the LAF Associate Advisory Board since 2014, and was the Co-Chair of the 2017 and 2018 Associates Campaigns. If your firm did not participate last year, there is still time to sign up for the 2018 Associates Campaign by contacting Kelly Bossley, Associate Director of the Legal Aid Foundation, at 303-863-9544 or kelly@legalaidfoundation.org.